I spent all weekend engaged in the business of art, with some parenting and socializing thrown in to keep me well-rounded. Saturday was orientation and site selection for Artomatic, which took a while because my dreams of a 3-D window space ran head-long into the reality of a 3rd floor view dominated by Nationals Stadium. Then I got distracted by disappointment over not getting space on a higher floor, where the light is much better. But once I determined that I could get both sides of a tunnel space - where I can suspend my piece and control the light - I was very, very happy. I could have taken a similar space on the 4th or 5th floors, but I met some nice people who are also on 3, and the tattoo parlor is on 3, so I figured it will turn out to be a fine floor. 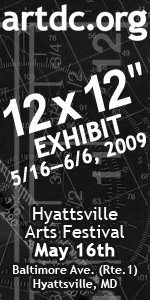 On Sunday I picked up my work from the Surfaces show in Hyattsville, dropped off the 3 very small burnt-match pieces for the ArtDC 12x12 show, which will be part of the Hyattsville Arts Festival (May 16th 11-5) then went back to Artomatic to paint my walls. I'd bought 2 gallons of miss-mixed, off-white paint, from home depot along with a gallon of stain-killer. I mixed all that with another leftover gallon of white from the 5th floor free-paint. The end result was slightly more salmon colored than I had expected - I may cut the remaining paint with more white and give the walls a second coat tomorrow after work. Now I have to decide whether to keep my Artomatic volunteer shift for next Saturday afternoon, or switch so that I can use the time to actually work on my piece... More on the actual piece soon.